Home » Telugu » News » Sammohanam tweet review: Could Aditi Rao Hydari and Sudheer Babu starrer impress the audience? Sammohanam tweet review: Could Aditi Rao Hydari and Sudheer Babu starrer impress the audience? From pre-release buzz to Aditi-Sudheer Babu's chemistry; everything about the film is being well-spoken and written. Check out audience review right here. 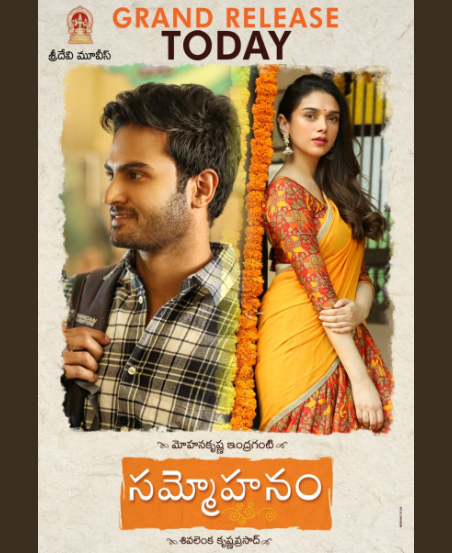 Aditi Rao Hydari and Sudheer Babu starrer Sammohanam has hit the screens today. The film that has been a talk of the town since its inception, has released today at the Box Office. The film is a coming age love story, which involves comedy and emotional drama. From pre-release buzz to Aditi-Sudheer Babu’s chemistry; everything about the film is being well-spoken and written. Also, Aditi Rao Hydari is making her Tollywood debut with this film, which is one of the highlights of the film. Movie buffs have huge expectations as Sammohanam is coming from Mohankrishna Indraganti, who is a class director. The director has given some mega-hits like Ashta Chamma, Gentleman, and Aami Thumi. Every song of the film reflects the creation of talented Vivek Sagar. From song Oohalu Oorege Gaalanthaa to O Cheli Thaara, which is a delightful, music of the film has been well received and connecting for the audience. He is really a promising composer.
.@isudheerbabu is a revelation in #Sammohanam . You have shown us an Unexplored artist in you. #Sammohanam is pure love.. Well written emotion on screen.. Naresh garu took over the movie.. Rahul Ramakrishna bhayya made it again.. Sudheer babu and Aditi Rao sequences are just amazing with super Cinematography.. Have a watch for good weekend 😍❤️👌A Director's movie!!! Have you watched the film? Share your views.